I was digging through my pantry the other day and realized that I had way too much stuff in there! I had a hodgepodge of baking chips and nuts in my pantry. I decided to use them up and make these Magic Crescent Bars. 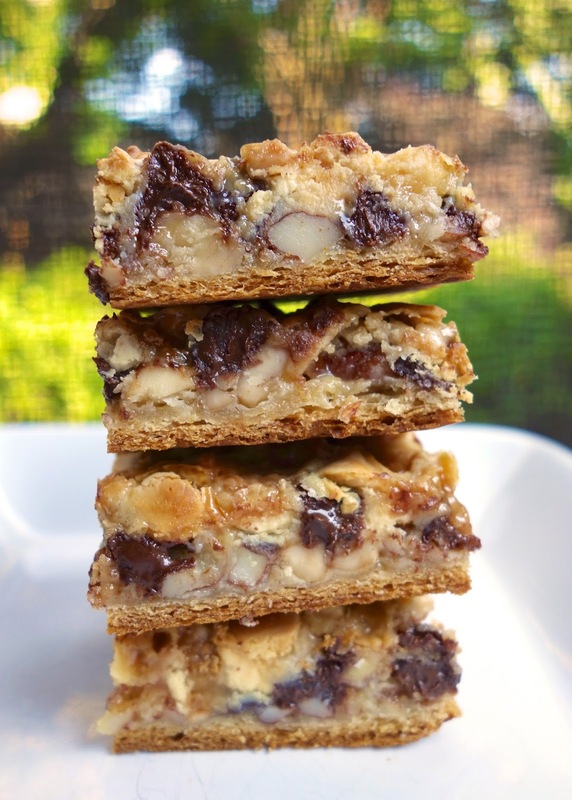 I used white chocolate chips and regular semisweet chocolate chips for these bars. Feel free to use any combination of baking chips you have on hand - butterscotch, peanut butter, bittersweet, you name it! For the nuts, I used cashews and almonds because that is what I had on hand. I think pecans, walnuts or even pistachios would be great too. I absolutely loved these bars; especially the cashews! I am a cashew fanatic and they tasted great in these bars. Give these a try the next time you need a quick and easy treat or you need to clean out your pantry! Preheat oven to 375. Spray a 9x13-inch pan with cooking spray. Unroll crescent roll dough. Place in pan; pinch seams to seal; press over bottom and 1/2 inch up sides to form crust. Bake 5 minutes. Remove crust from oven. 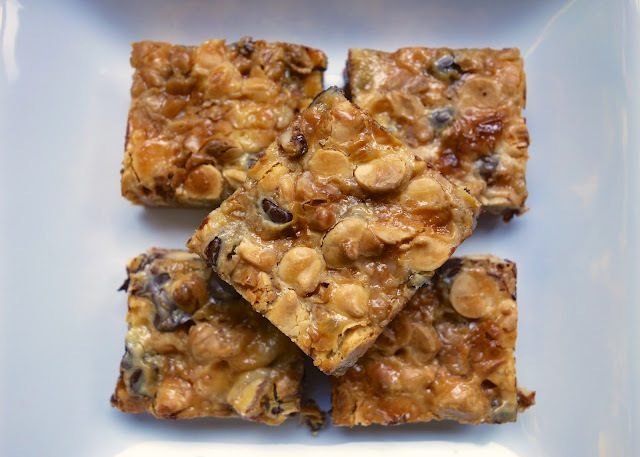 Sprinkle white chocolate chips, chocolate chips, almonds and cashews evenly over crust. Pour condensed milk evenly over top. Return to oven; bake 20-25 minutes, or until golden brown. Allow bars to cool completely. Cut into squares. I have the same condition in my pantry - 1/2 bag of this kind of chips, 1/4 bag of those, etc. And I have a potluck to go to this weekend - perfect timing! Thanks! Oh those look so yummy! I am definitely going to have to try this recipe. Do these need to be refrigerated after? Thanks. Carrae - I did not refrigerate them.